Anthony "The Booky" Hardy has won the PartyPoker World Open. Taking money from sports punters clearly isn't enough for Hardy, now he's started on us poor poker players! Bookmakers are loved worldwide... almost as much as estate agents and tax inspectors! 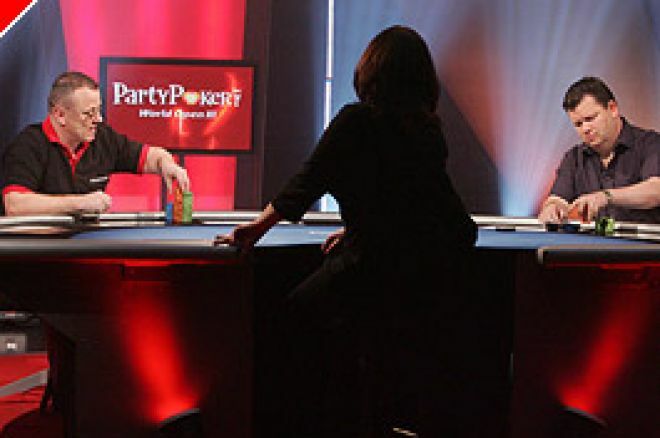 Now poker players have extra reason to be wary of bookmakers. Well, one of them at least! Anthony Hardy has just crushed a 72 player strong field to win the PartyPoker World Open. A field which included Roland De Wolfe, Juha Helppi, Dave "The Devilfish" Ulliott, Liz Lieu, Ian Frazer, Thomas Wahlroos and The Hendon Mob were dismantled by Hardy is dramatic fashion. Few suspected the 45 year old from Sidcup, Kent would make any impression on such a star studded line up. Partybets.com quoted Hardy at "double carpet" 33/1 before the tournament started. Needless to say, Hardy backers were grinning from ear to ear today as their "horse" trotted home. "It is a dream to win the tournament, I'm so chuffed," said Anthony, whose nickname "The Booky" is influenced by the spelling on his car registration plate. "I didn't hit many cards in the semi-finals or finals but I just continued to hang in there." In the closing stages in was a battle of the Londoners as Hardy took on Ian Woodley (pictured) in a fascinating heads up encounter. Woodley had the chip lead but Hardy wasn't worried. "When it was just Ian and I kept telling him I would win," said Hardy, "it is sweet revenge for when he beat me in the Poker Den a couple of years ago." A PartyPoker spokesman said: "Anthony's patience and never say die approach made him a deserved winner. "The Booky" is the kind of player you don't find as often these days, he is an old school live cash game player but got involved in tournaments when internet poker took off. You won't find him with an iPod or headphones on but you might need both if he is trying to talk you off a hand!"